Posted September 9, 2016 & filed under Events in Dewey Beach DE. Everyone’s favorite fall celebration returns to Dewey Beach on Friday, October 28! The 27th Annual Sea Witch Festival will be bringing seasonal excitement to the beach all weekend long, providing plenty of opportunities for laughter and fun with your children. There will be games, parades, trick-or-treating and costumes galore all along the coast, with a few of our favorite events taking place right here in Dewey. Start your Friday night off with an hour of family-oriented, candy-filled fun. Trick or treat your way through the town of Dewey Beach, stopping by participating shops from 6:30 to 7:30 p.m. 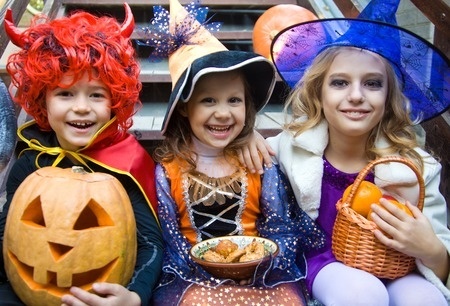 Your children will love the opportunity to try on their costumes and kick off Halloween early, and you will get to check out all of the unique, local attractions in town. Once your children’s candy bags are stuffed, head down to where Dagsworthy Street meets the beach for a night of spooky, kid-friendly fun. With a DJ playing all your favorite spooky tunes and plenty of ghostly games and activities for your children to try their hand at, this night is sure to be one to remember. You can even grab a seat at the campfire to enjoy refreshments as the story teller shares some spooktacular ghost stories! For families looking to entertain their tweens and teens, we recommend paddling out on the ocean with Delmarva Board Sport Adventures on Friday, Saturday or Sunday night. This 90 minute SUP board excursion costs $99 per person and is a blast for children 12 and older. You can make your reservations by calling the shop at 302-260-9008. After this once-of-a-kind experience, your children are sure to be bragging to their friends about the awesome family vacation they went on! Interested in joining the Atlantic View Hotel – and the rest of the town – in celebrating this year’s Sea Witch festivities? Just visit us online, book your hotel stay and get to work on your Halloween costumes! We can’t wait to see you here.